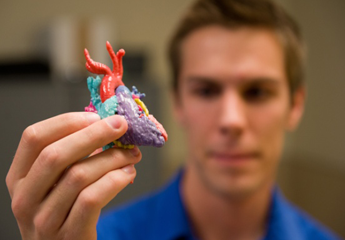 Justin Ryan, a graduate student at Arizona State University shows how he models and 3D prints heart models. He takes the two-dimensional images from CT scans and sends it to a 3D printer to print out the model. The 3D printer, ZPrinter 650 from 3D Systems, could print out a heart model of one-year-old child in about three hours. The model is printed by shooting colored glue on layer by layer of plaster powder, forming the model according to the precise specifications of the data.